For many years I had wondered who Hilary A. Hacker was. In the carabidological literature she appeared on the scene in 1968 with the publication of one of the best revisions of a carabid group that had been done to date, and then she just as quickly disappeared. 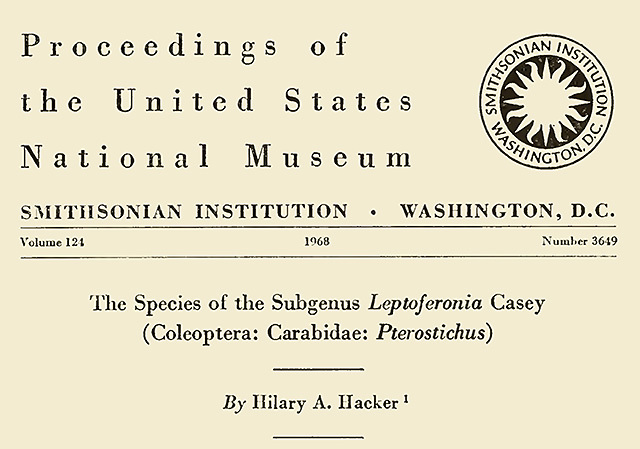 Her work “The Species of the Subgenus Leptoferonia Casey (Coleoptera: Carabidae: Pterostichus)”, published in the Proceedings of the United States National Museum, is a very thorough work. It is concisely written, but full of details, with excellent genitalic and habitus illustrations, and maps. Her revision is based upon her very extensive collecting efforts – she studied about 2400 specimens, most of which she collected herself throughout western North America. It is one of those revisionary works that is satisfying to open and use because of its quality. My curiosity about Ms Hacker was not just a result of her single, unusually good publication, but also because the Oregon State Arthropod Collection was fortunate to receive, some time ago, much of Hilary’s collection. I had been curating and looking at the Bembidion she collected, and found some important specimens from throughout the western USA, and down into Mexico. This piqued my curiosity more: who was this excellent collector who travelled seemingly alone for many thousands of miles? Kip Will, I suspect, had been even more curious about Hilary, as Leptoferonia are some of his core study organisms; her 1968 publication is the groundwork for all that he has done on the group. Until recently, I had thought that perhaps Hilary Hacker was no longer alive – but then Kip did some sleuthing and tracked her down, to the hills near Redway, California. A few letters and phone calls later, and an expedition to meet Hilary was in the works. 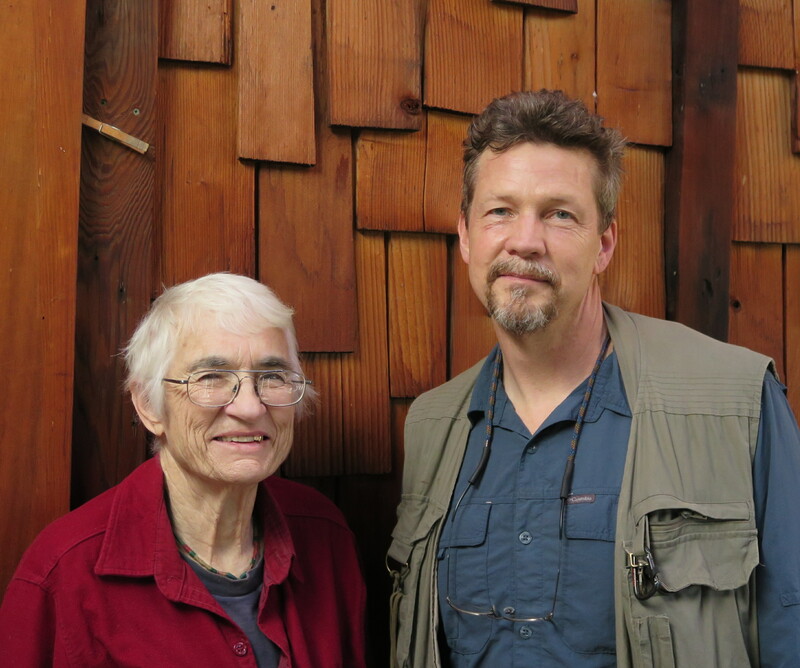 This past February, Kip, Christopher Marshall, and I drove from Kip’s house in the Bay Area north to Redway. And there she was, stepping out of a blue pickup truck. Her short hair, red flannel shirt, plaid jacket, jeans, and tennis shoes revealed a no-fuss, practical person. Now in her late 70s, her lively eyes spoke of a still razor-sharp intellect. 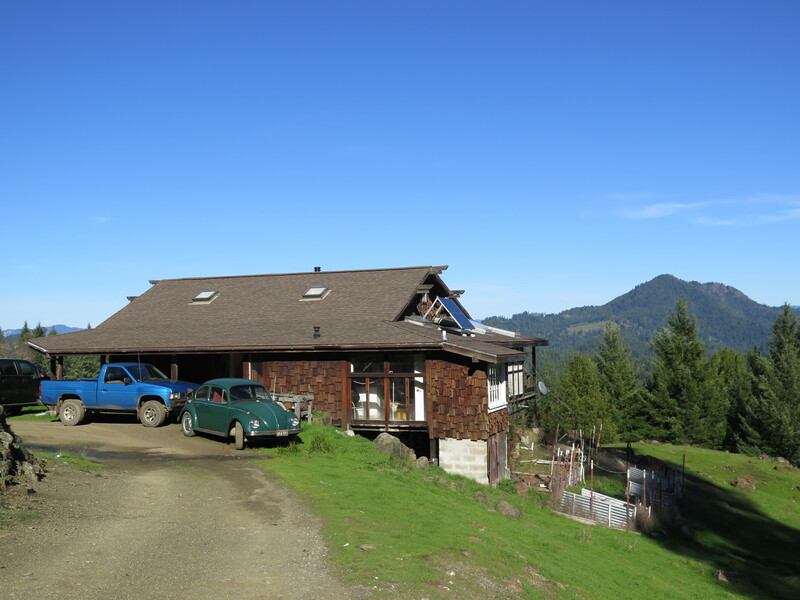 We ate lunch with Hilary, and she then led us west into the hills to her off-the-grid house, which she built, and now shares with Betty. We had a wonderful time. The best part for me, by far, was to see Hilary and Kip together, the two people in the world who most understand and love Leptoferonia. 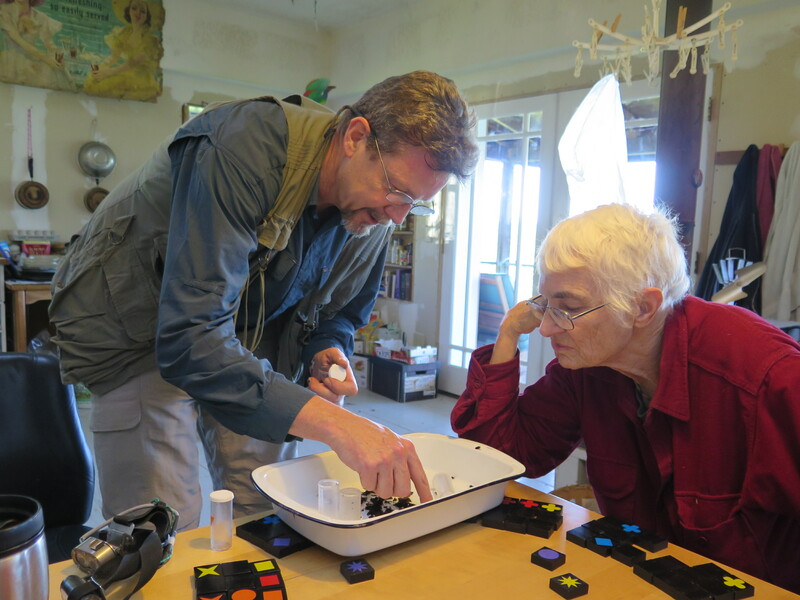 We talked to Hilary about her history, and how she came to do her Leptoferonia work. Her family is from Seattle. She noted that her grandfather collected butterflies, which was an inspiration to her; her father was a fish biologist. She went to Reed College for one year, and then graduated from San Francisco State. She was a lab technician, at least in part in soil science at Oregon State University. 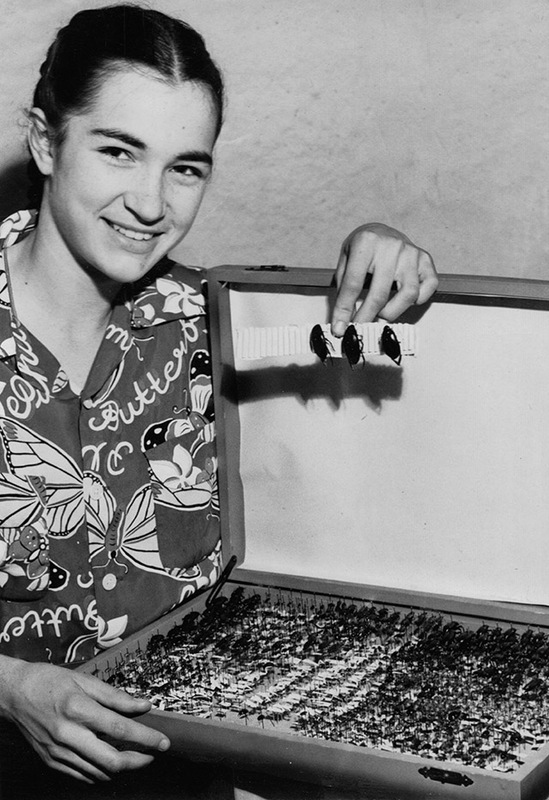 She said that when Hatch’s series on the Beetles of the Pacific Northwest came out, she became interested in Leptoferonia, and began working on them. As she travelled the logging roads of the west in a VW bus in the late 1950s and into the 1960s, collecting Leptoferonia and other carabids, her only companion was her dog. In the stories she told us, there was no mention of a mentor, of someone from whom she learned the trade. Her answer to my queries about this yielded the most astounding response: she had no direct mentor. She learned from the literature, correspondence with others (including George Ball), and had some help from Kenneth Fender. But she did not have a mentor under whom she studied, and so in that sense she was self-taught. That she managed to accomplish such excellent work with Leptoferonia on her own speaks to her focus and abilities. During our visit, Betty brought out some old pictures and newspaper clippings about Hilary. Included in these was the following gem of a picture, of Hilary when she was 13 years old, in 1951. The accompanying newspaper is titled “Hilary Hacker Prefers Beetles to Beethoven”, and states “She loves beetles. All kinds of beetles. And she has more than 400 of them.” How wonderful for our community that her passion lasted for a couple of decades, allowing her to produce her Leptoferonia revision. While visiting her, we collected some Leptoferonia around her house, and Kip put them in a tray. I sat back and watch the animated conversation as Kip and Hilary talked about the little beetles scurrying around. It was a magical moment. I watched two kindred spirits, and felt a very deep bond with these people who are so enthralled by the organisms with which we share this Earth. 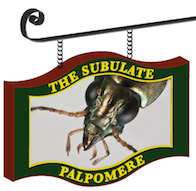 This entry was posted in Fieldwork, Taxonomic Process and tagged Carabidae, history, Leptoferonia, Pterostichini, revisions. Bookmark the permalink. Thanks for the great blog on a wonderful trip! It really was a great trip. Thanks for being part of it! I loved this story, but there were details I wanted to know: Why did Hilary leave the research she loved and so good at? What career attracted her instead? Yes, those details weren’t stated. I don’t fully know the reasons she left. One component that might be relevant is that she realized at one point that she always wanted to be a carpenter. Great article. My sister is Betty and Hilary is my sister-in-law, both incredible women. I’m very happy you dropped by! Send them my best, please!